Quality improvement (QI) is an essential component of 21st-century medicine. According to Robert Johnson, “Clinical excellence has four key elements: delivering the promise of quality healthcare, providing a personal touch, doing a more than adequate job, and resolving problems well.” To effectuate these elements, healthcare institutions, in particular, must be cautious about reducing the drivers of dissatisfaction and providing exceptional and unprecedented healthcare. In the current health care scenario, where quality health care is taking huge strides, clinical excellence goes hand in hand with quality initiatives. It is not an adjourn path to achieve clinical excellence but is a tedious path which involves mammoth amount of teamwork, leadership, dedication, continuous training, and monitoring. Hence, achieving clinical excellence is a sapling which blooms from the seeds of efficient quality management system in the hospital. Dr. Shroff's Charity Eye Hospital (SCEH) is National Accreditation Board for Hospitals and Healthcare Providers (NABH)-accredited organization which firmly believes in amalgamating quality measures with clinical processes and bringing out the most effective clinical environment for best patient care, one of the values of the organization. Clinical excellence is achieved through a stepwise approach. At SCEH, we followed these steps to bring out the best clinical outcomes and hence ultimately sufficing our goal to have utmost patient satisfaction. Constitution of a quality core team and commitment by the top management for continuous QI in hospital was the key. Under the right circumstances, a team harnesses the knowledge, skills, experience, and perspectives of different individuals within the team to make lasting improvements. The core team was the backbone of all system-wide programs for clinical excellence. The team provides direction and support for accreditation, conducts and facilitates clinical audits, builds capacity for quality management, and develops, rolls out, and monitors clinical indicators. In addition, it worked closely with the departments for clinical protocols' development and deployment and provided training and development support. In addition to staff, a key component of a well-functioning QI team is an effective infrastructure, such as leadership and policies and procedures to organize and facilitate the work of the team. Infrastructure support facilitates the team with tools, resources, clear expectations, and a forum for communication. Other committees constituted were Hospital Infection Control Committee, Medical Records Committee, Safety Committee, Drug and Therapeutics Committee, Clinical Audits Committee, and Internal Enquiry Committee. The first five committees contributed a lot toward achieving clinical excellence. A standard is an expected level of quality or an acceptable level of performance that can be written and explicitly documented including clinical protocols, procedures, or ethical rules. Where explicit standards are not available, standards agreed by all and based on the experience of professionals (implicit) can be defined. Many quality standards already exist in the health industry with varied levels of recognition at international (e.g., ISO, JCI), national (NABH), and state levels. The decision to choose NABH standards was very strategic because an NABH accreditation is a widely accepted measure of standard among private- and public-sector payers in India and an essential requirement to be empanelled on several payer networks as a preferred provider. 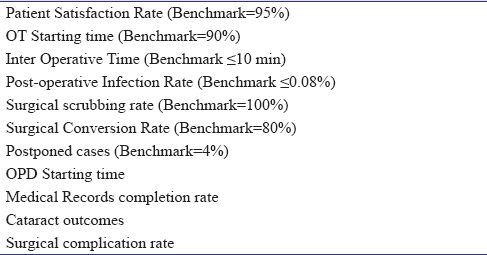 NABH has clearly defined patient- and organization-centric standards of performance for a hospital [Table 1]. To achieve an NABH accreditation, a hospital has to provide evidence, through a rigorous external assessment, of having achieved an acceptable level of performance against each of the defined standards. However, these standards do not provide support, information, or tools to help hospitals achieve them. It is upon hospitals to identify their approach for achieving and sustaining compliance with the required standards. NABH accreditation is time limited and needs reassessment every 3 years. Loss of accreditation has significant implication on hospital's brand image and business positioning. Hence, any quality management system will have to be sustainable and internalized so that accreditation is achieved and sustained [Table 2]. A quality vision statement by SCEH was developed to communicate management's vision for quality to all staff members. The quality vision statement clearly defined high-priority goals and ensured that the priority areas for improvement identified through the baseline assessment were addressed. Develop and implement an orientation and induction training program for new employees and a system to assess and communicate the performance of all employees on a periodic basis. 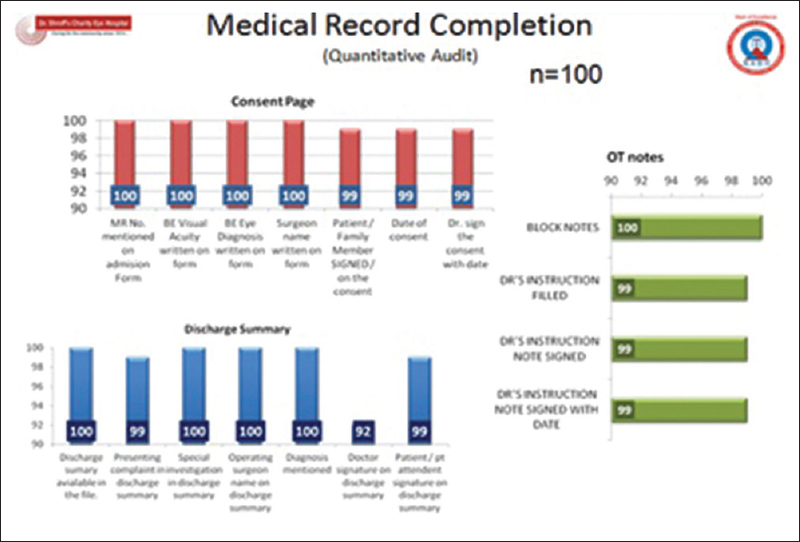 Service improvement: Well-documented records can also lead to improvisation in service delivery to the patients by helping the staff members organize their thoughts. Aggregated and concrete information can also assist in planning, development, and reviews of services. It can also be a source of primary data to conduct evidence-based research. At SCEH, standard operating procedures (SOPs) were drafted for each department (clinical and nonclinical), illustrating the activities performed in a department and responsibilities along with references. The SOPs help in increasing efficiency of tasks, forming consistency in system, reducing errors in the processes, evaluating performance, conducting audits, and promoting teamwork in the organization. Continuous training is provided to the clinicians to be in pace with the SOPs. SOPs are reviewed biannually. Moreover, they are made by the process owners and their team members; so, their active involvement leads to higher accountability. At SCEH, regular capacity building of the clinicians is done on writing SOPs and manuals. Regular training classes are also held to capacitate the clinicians on proper filling of medical records. [Figure 1] elicits the points which are checked and monitored in medical record files every month in SCEH. The results are presented in front of clinicians, and this approach of monitor and feedback makes them more accountable toward following the documentation process stringently. The meeting minutes of committees are also documented and proper follow-up is done to check whether the issues have been closed through required actions or not. The audit reports and closure reports of internal audits are submitted by the auditors, and their log is maintained annually. Hence, documentation plays a vital role in achieving clinical excellence remarkably. Assessment of quality of care has become rapidly crucial to service providers, regulators, and consumers of care. In recent scenarios, service providers have shown their interest in evidence-based medicine and consumers have started to converge on the cost-effectiveness of healthcare in achieving suitable health outcomes. Performance and outcome indicators allow the quality of care and services to be assessed and measured. This assessment can be accomplished by forming quality indicators that illustrate the performance that should occur for patients or the respective health outcomes, and then evaluating whether patients' care is in line with the indicators based on evidence-based standards of care. Quality indicators are defined as, “Measures that assess a particular healthcare process or outcome.” Quality indicators are quantitative in nature that can be used to monitor and evaluate the quality of clinical, support, and management functions. They are used to monitor, evaluate, and revamp the quality of patient care hence improvising patient satisfaction. Indicators provide a quantitative basis for clinicians, organizations, and planners aiming to achieve improvement in the processes by which patient care is provided. Measurement and monitoring of indicators serve various purposes. They make it possible to document the quality of care given to patients; make comparisons (benchmarking); make appropriate judgments and elicit accountability, regulation, and accreditation; support continuous QI; and support patient choice of providers. Indicators measure the extent to which set targets are achieved and are expressed as numbers, rates, or averages that can provide a basis for clinicians, organizations, and planners aiming to achieve improvement in patient care processes. They can be measures of structure, process, and outcome. Outcomes may be of major interest to the patients or payers of care, while providers who are receiving data for QI purposes need detailed data about the process of care to make the information credible and possible to act upon. Use of relevant quantitative indicators aids in the surveillance of healthcare quality, supplementing other approaches that may include qualitative analyses of specific events or processes. At SCEH, a list of indicators was developed to track progress on patient experience outcomes and process measures related to quality of care and clinical excellence. Quality-of-care measures included indicators on patient safety and clinical effectiveness. Indicators which are essential to achieve clinical excellence are monitored at SCEH regularly as shown in [Table 2]. With effective interventions, we try to improve the compliance of quality indicators to bring clinical effectiveness into the system and processes. For instance, we monitor interoperative time, the benchmark of which is 95% (<10 min), the representation of which is shown in [Figure 2]. As said by various quality experts, to sustain improvement, control is required; hence, regular monitoring of quality indicators is an apportionment of continuous QI. In SCEH, monthly meeting is held with the key stakeholders where the data are presented in front of them. The improvements, gaps, and interventions are discussed in the meetings, and crucial decisions are made to make continuous improvement. Healthcare as an industry is known for resistance toward change. Workforce engagement and accountability has been identified as a key principle to ensure successful implementation of QI initiatives. Evidence suggests that building a sense of ownership is a key factor in attenuating resistance and driving change toward improvement. Therefore, SCEH's total quality management implementation strategy was built around three principal approaches. Conduct regular audits and identify specific areas of improvement. Coordinating, guiding, and coaching HODs, Unit Quality Committees, and process owners. Facilitating monitoring exercises and supporting data collection and analysis. The team would then pilot test and evaluate the solution with support from the QRC team. 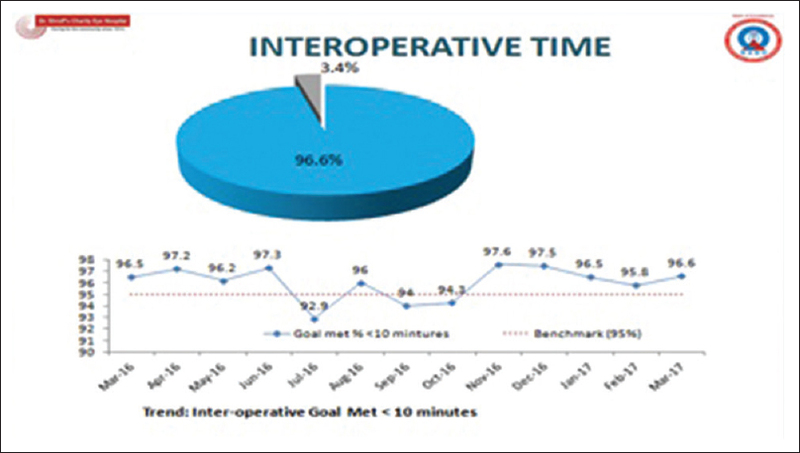 The core quality team partnered with the Unit Quality Committees to identify critical and noncritical processes undertaken within their units and worked with each Unit Quality Committee to standardize their processes in line with the adopted NABH standards and supported drafting of standard operating protocols. These protocols were made accessible to all through the hospital intranet. The core team then supported the Unit Quality Committee members to schedule and conduct coaching of staff members to adopt the standards of care. The core quality team appointed an Audit Committee and supported it with training and monitoring tools to track progress on compliance with adopted standards (NABH) and predefined performance indicators and ensured audits are conducted at least twice a year. SCEH has a separate Clinical Audit Committee as mentioned before, which is responsible for conducting regular clinical audits in the organization. Various clinical audits have been conducted, for instance, audit to see if the guidelines for management of postsurgical infection are followed in patients postsurgery, audit to examine if the protocol for management of angle-closure glaucoma is followed, audit to examine if the protocol for examination of infective keratitis is followed, and prescription error audits. Postdata collection interventions were made as per the needs, and reaudits were conducted to analyze the postintervention situation. The audit reports and findings are shared with the key stakeholders and unit committees. Hence, audit and review are important tools which assist in achieving clinical excellence. Clinical excellence is performing at a level well above satisfactory — both qualitatively and decisively. When physicians achieve a level of mastery in serving the patients and organizations, they give their best to the healthcare in efficient and effective ways. The quality measures as mentioned if implemented and executed in the organizations effectively can propel clinical excellence prodigiously. In the present scenario of healthcare, quality and clinical excellence remain in symbiotic relation. The clinicians at SCEH are exemplary, having demonstrated leadership in the delivery of clinical service and in the development of new ideas and improvements. These clinicians are able to quickly diagnose and treat clinical problems and adhere to a scholarly approach to medicine. They exhibit a passion for patient care, and they explicitly model all of the above to medical trainees, thereby earning an exceptional reputation in healthcare in India and abroad. SCEH will continue to maintain the decorum and breaking stereotypes in terms of achieving clinical excellence. Kapur N. On the Pursuit of Clinical Excellence. University of Southampton, UK: Addenbrooke's Hospital, Cambridge, and Department of Psychology; 2009. Marley KA, Collier DA. The role of clinical and process quality in achieving patient satisfaction in hospitals. Decis Sci 2004;19:128-9. Ferlie EB, Shortell SM. Improving the quality of health care in the United Kingdom and the United States: A framework for change. Milbank Q 2001;79:281-315. Mainz J. Defining and classifying clinical indicators for quality improvement. Int J Qual Health Care 2003;15:523-30. Freeman T, Walshe K. Achieving progress through clinical governance? A national study of health care managers' perceptions in the NHS in England. Qual Saf Health Care 2004;13:335-43. Quality Improvement – U. S. Department of Health and Human Services Health Resources and Services Administration 2011.